The Palio of Siena is one of the most famous, amazing, muscular and exciting horse race, really popular among the great numbers of historic festivals held in Italy. The contest is held to win the palio in the Piazza del Campo or Il Campo, Siena’s fan-shaped main piazza. Siena is split into 17 neighborhoods (contrade), and each will present a rider. 10 “contrade” will be the stars in the first race, opening July 2, and they will be chosen by a draw exactly 20 days before the big race. The other 7 plus 3 from the July race will fight on August 16. The horses are given to the riders again by a draw exactly three days before the race! 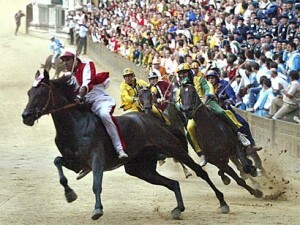 Other events take place also around the days of the palio, starting June 29 and August 13. The race day starts of course with a special mass, a trial runs by the jockeys, and the blessing of the horses. In the afternoon everything starts at 3pm. A procession through the historic centre of Siena are held with costumed participants and flag throwers, coming from each contrada towards Il Campo. The horses are lined up behind a rope and then ready, steady, GO! The race is about 1000 meters, with horses circling the track three times. The winning contrada of the horse is awarded with the victory flag. And in the while you are here try some typical food! Senese recipes stem out from Etruscan time. Roasted meat, wild game, and several types of pasta as well as soups are a very important part of Tuscan dishes. Spices give distinct taste to Siena’s typical “dolci” such as Panforte and Cavallucci. Siena’s cuisine is coming from peasant, so it is simple, but excellent thanks to its ingredients. Senese food are of excellent quality, and most recipes use the highest quality of olive oil. The oak woods around Siena are well-known for the Cinta Senese swine, a native swine famous for the exquisite flavour of its meat. In Val di Chiana area you will find the unique Chianina breed of cattle, originated during Umbrian and Etruscan times in central Italy! Chianina cattle are reputed for their white skin and big size. This entry was posted on Monday, July 30th, 2012 at 7:35 pm	and is filed under Events in Italy. You can follow any responses to this entry through the RSS 2.0 feed. You can leave a response, or trackback from your own site.